In our Sayonara Wild Hearts PAX East hands on, we mentioned that another of the games Annapurna brought to show was Wattam. A curious title from Keita Takahashi, the creator of the Katamari games, Wattam is an utterly charming title that, to put it mildly, is incredibly bizarre. The gameplay demo starts with you taking control of the mayor of a city as you learn the basics of control. You hold hands with other beings you encounter, climb, and, erm, unleash explosive fireworks from beneath your hat. It’s all in service of reaching the next confounding scenario. 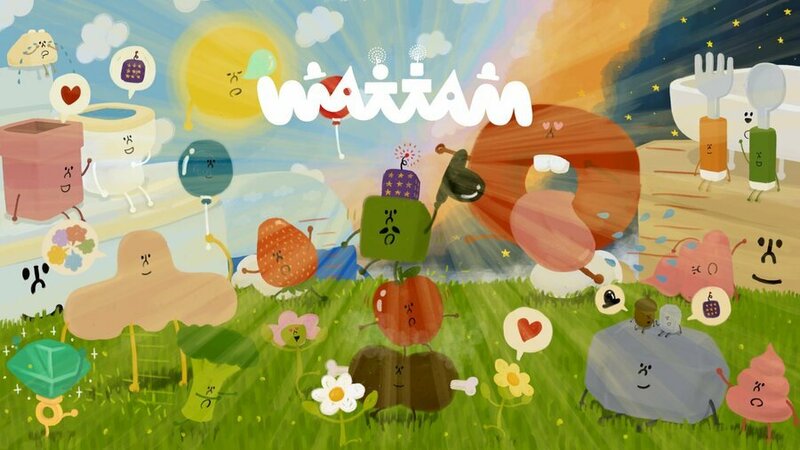 For those familiar with the Katamari titles, the innate strangeness of Wattam will feel very familiar. There is an order and logic to everything in the game, even if it might not adhere to what could be traditionally described as logical. Thus, you have to blow up your hat to summon a giant popsicle that you need to climb to reach a toilet. Of course. We actually spent quite a bit of time playing the game and even now, we’re not entirely sure what it is. There seemed to be forward momentum in that you had to eat things to summon new things to eat, but to what end we honestly don’t know yet. This isn’t to say that the game lacks for fun, however. It's so engaging in its strangeness that we actually wound up losing track of time, causing us to show up a couple minutes late for our next appointment. And frankly, no higher compliment can be paid to a game than losing track of time while playing it. The gameplay is a little tricky to lock down, but the eating that we mentioned earlier is but a piece of the puzzle. The game comes off as a sequence of puzzles that continually expand the scope of the world you exist within. There are platforming puzzles, aforementioned eating puzzles, logic puzzles, and everything more or less behaves as you would expect it to. And this fact is key: the regular puzzle solving logic you bring to this illogical world generally applies. It creates order out of something that would otherwise be utter chaos, and is definitely a massive contributor as to why the title is as fun as it is. Another startlingly impressive aspect of the title is its music. There were multiple instances during our session that gave us pause due to just how engaging the piano music was. The piano-heavy score is charming and quirky, and perfectly complements the title. It actually reminded us a lot of many of Joe Hisaishi’s scores, namely the work he’s done for Studio Ghibli on their lighter-in-tone projects. As the game inches closer – its targeting release in 2019 – we’re excited to see and hear more about it. And maybe, just maybe, we’ll figure out just what this game really is. Because what we played was simply delightful. 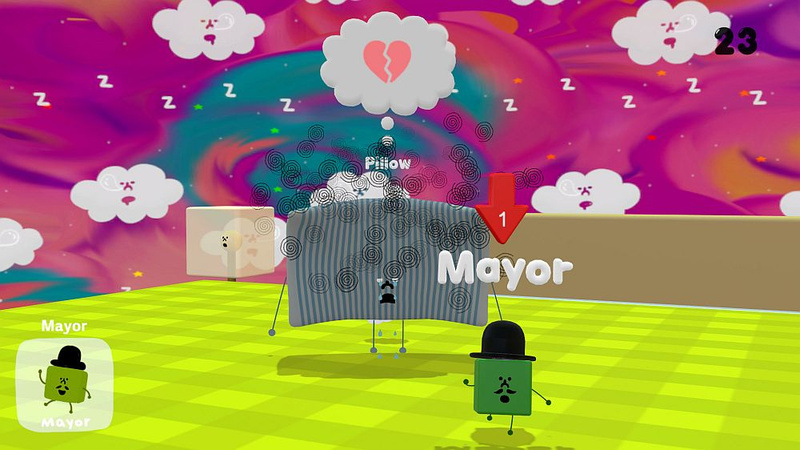 Have you been waiting patiently for Wattam? Do you like what you've heard about the game so far? Explode your hat in the comments section below. Wasnt this announced around the time of the ps4 reveal? Crumbs how time has flown!! @Rob_230 Close, PSX 2014 to be exact. @Rob_230 i'm surprised because they are only releasing it now, thought it was cancelled/forgotten. Wait this game still exists!!!?? I wonder what happened to titles like this and Edith Finch that were once going to be PS4 exclusive, then were snatched up by Annapurna? I saw Joe Hisaishi's name and nerded out for a split second thinking he was doing the score. @3Above Not only does it still exist, it's expected this year! Yeah it's a bizarre scenario, that might go unanswered as far as the specifics. I'd certainly be curious. Quite the slate for Annapurna though! Been waiting on this one for years. So glad it’s finally close! I’ve always loved Katamari & Noby Noby Boy. @huyi @AdamNovice wow, thanks both. I wonder what happened during development for it to take this long. I hope it has sufficient success to reflect the years of work that has gone into it. Although like the preview says, i still have no idea what its about! Can't wait for this! Love Katmari and Noby Noby Boy, and I can't see Wattam being any different. This feels like it was announced an age ago. Surprised it's still alive to be honest. Don't remember it being talked about that long ago, but the game looks kind of fun and weird like all of the games that come from this company. Will definitely pick it up, but I really wish that a game for the Wii would get a re-release...THE MUNCHABLES. This was a great game on the Wii that was overlooked and incredibly fun, even though the voices were horrible, other than that, a great addicting game.